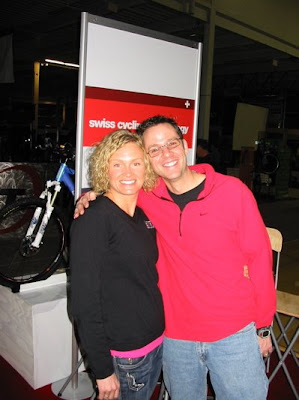 Team Evotri: Chillin' Out at Frostbike, '08! Chillin' Out at Frostbike, '08! One great to look forward to when the cold weather comes is all the hot gear on display thanks to QBP's Frostbike show in Minnesota. The annual event took place a few weeks ago, and featured over 100 of the top tri-brands on the market including our very favorites, BMC, CycleOps, Zipp and SRAM. Team Evotri was among the invited guests, and as you can see from the pictures below, they had an awesome time! Thanks to QBP for their hospitality, and to all the sponsors who took time to sit and talk with us and show us around. To see more photos and to learn more about Frostbike, please visit www.frostbike.com. TJ Tollakson and Becky Lavelle were among the crew at Frostbike who stopped for a chat with our own Simply Stu and Rural-Girl. 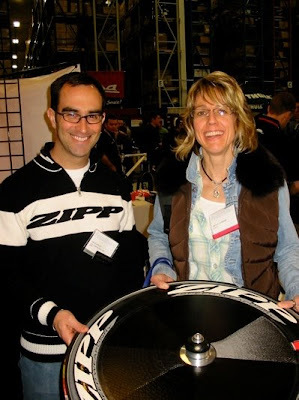 Dave Ripley - Product Manager for Zipp, and Rural-Girl present the latest and greatest in speed technology. 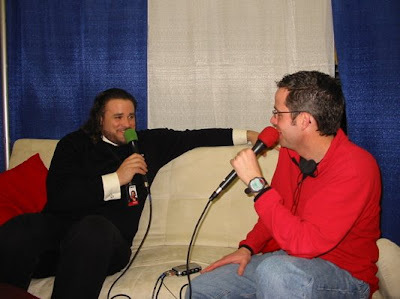 Simply Stu interviews the always charming Scott, brand manager for BMC. 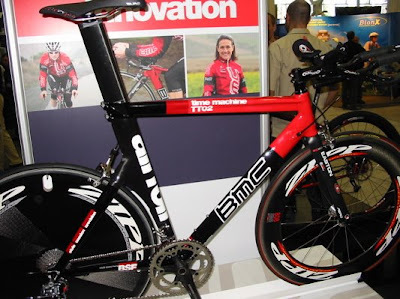 A tricked out and fierce BMC TT02 - the official bike of top pro triathlete Tyler Stewart and Team Evotri. 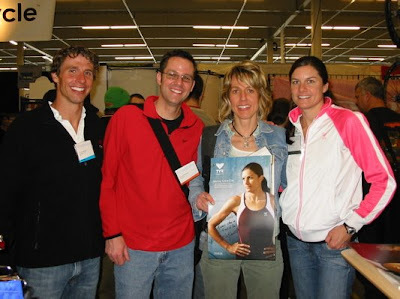 BMC athlete and 3-time Xterra World Champion Melanie McQuaid chills out with Simply Stu at Frostbike, 2008.